In our hunt to find the best new women’s shoes for travel, we gathered samples of shoes that have been released this year. We limited our selection to shoes (no boots or sandals) and extensively wear-tested them, walking for miles. We then evaluated each shoe on the following: weight, packability, style, comfort, number of miles you could walk comfortably while wearing them, arch support, versatility, and technology. These are our winners. 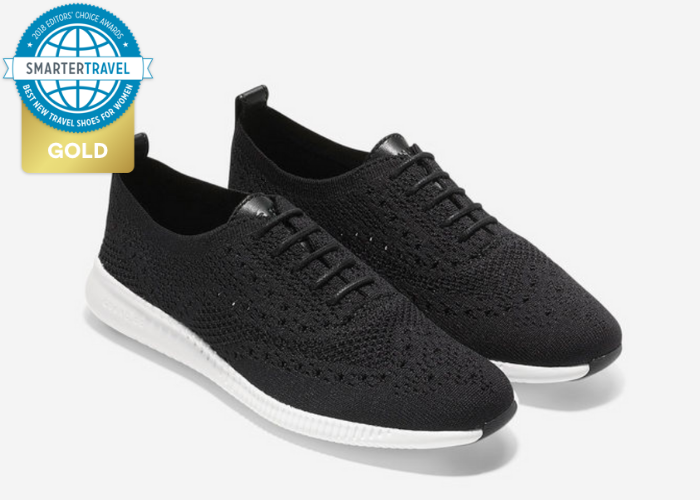 Click here to see our other Editor’s Choice Award winners, including the best new travel shoes for men. 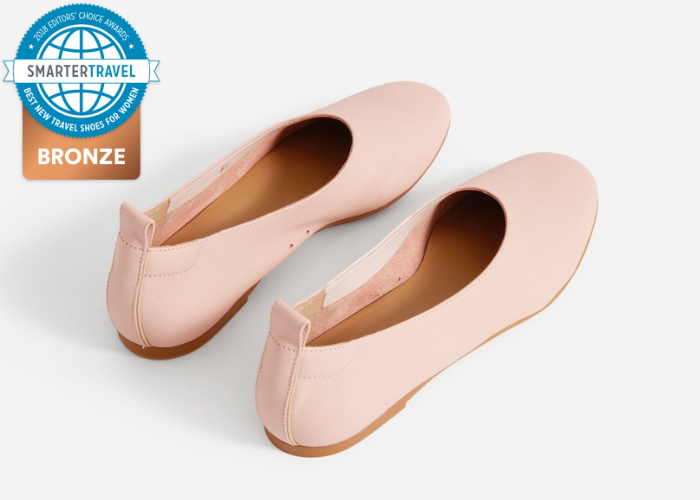 Cole Haan’s 2.ZEROGRAND Oxford with Stitchlite won our Best New Women’s Shoes award, and earned a permanent spot in our suitcase (and on our feet). The patented stitchlite stretch knit upper molds to feet and allows the shoes to be worn without socks. The fabric also allows in plenty of airflow, and makes these shoes incredibly lightweight (and easy to pack, as they compress down nearly flat). The Grand.OS energy foam soles feel like running shoes—these could easily double as a workout shoe on your trip, as they offer plenty of support and cushioning. The Oxford style elevates these from a normal sneaker look. Our tester wore them around Europe with both dresses and black pants, and felt very stylish. 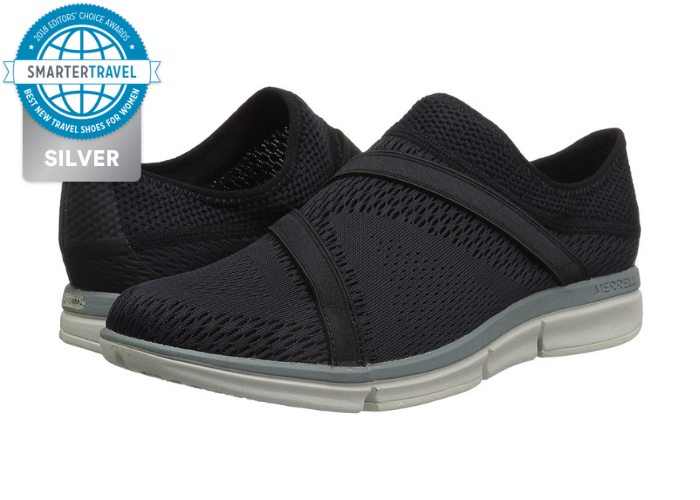 Merrell’s Zoe Sojourn E-Mesh sneakers are the perfect shoe for flying—they slip on and off easily, and won’t look out of place once you get off the plane. The stretch upper gives your foot room to expand, while a breathable mesh lining allows for plenty of air circulation. A unique Kinetic Fit Trip insole provides support to all three arches of the foot, but is removable in case you’d rather use your own insoles. At just 4.1 ounces, these shoes are also extremely lightweight. The Day Glove flats from Everlane prove that you don’t have to sacrifice function for fashion. These stylish flats are made from 100 percent Italian leather that is designed to mold to your foot for a custom fit. A back pull tab makes these easy to take on and off, and these shoes offer a surprising amount of support and cushioning, thanks to a rubber sole and cushioned insole. Designed by Harvard MD Dr. Casey Kerrigan, the OESH Dream Flats are the result of 20 years of biomechanics research. The Dreams fix the comfort problems of standard ballet flats: a wide toe box prevents cramping and blisters, and the Dream sole is made from a springy material that protects your feet from impacts and shock. 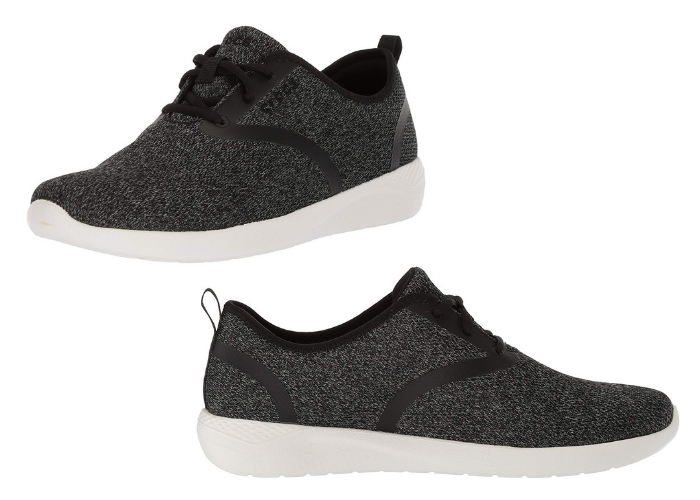 These stylish knit shoes look good in a variety of colors, and are machine washable. Crocs LiteRide Lace-Up Sneakers are lightweight, well cushioned, easy to pack, and comfortable enough that several online reviewers described wearing them as “walking on clouds.” They have a relaxed fit, so even though they don’t come in wide sizes, those with wide feet may be able to make them work. However, if you need arch support, you’ll have to insert your own; there’s none built in. Because they look like sneakers (albeit attractive ones), they’re not ideal for a nice night out. But if you have casual evening plans, these could effectively go from day to night. Ja Vie Ballet Flats are made from a flexible jelly exterior to allow your foot total movement. A breathable cotton liner prevents blisters, and the entire shoe can be washed. The shoe is also water-resistant in case of sudden showers. These ballet flats have a half inch of cushion on both the ball of the foot and the arch, so you’ll feel like you’re wearing sneakers rather than flats. Chaco’s Ioania Lace Leather Sneakers are a good option if you’re looking for a sneaker that’s a bit more stylish than the standard athletic ones. The Ionias have a full grain leather upper that creates a more polished look, but the inside has a recycled canvas lining that’s breathable and comfortable. The footbed is made from a trademarked Luvseat design that’s certified by podiatrists. The Ten Thousand Islands Freestate sneakers are lightweight and would be good for warm-climate beach trips where you want to do some walking but don’t need a serious walking or hiking shoe. In order to be quick-drying, the interior of the shoe is minimalist, without much in the way of structure or padding. The shoes are styled as sporty athleisurewear, and they can be worn with or without socks, which can further cut down on packing weight (fewer socks to pack). We tested a prototype of the Freestates, which are currently only available via a Kickstarter campaign. Editor’s Note: Some products are sent to us free of charge and with no incentive to offer a favorable review. We offer our unbiased opinions, positive and negative, and will never accept compensation to review a product. If you have any questions or comments concerning our reviews, or would like to suggest a product for review, please email us at editor@smartertravel.com.